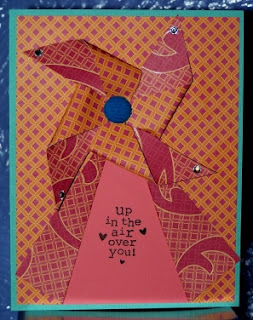 The "windmill" as I call it, was created using scraps of discontinued Stampin" Up! dsp. The sentiment is a stamp from the Stampin' Up! set - Up, Up and Away which also has some hot air balloons in it. I used a torquoise cs cause I wanted to add another color to the scheme of things. The rhinestones and the brad are also Stampin' Up! products. Hope you enjoyed viewing my card for the TTTC#51. Why don't you play along too! Don't forget to checkout my OFFER. I only have a couple of spots left. ps I have candy on my blog if you're interested in entering. What a great card - Love your Windmill.